Why do I not need to remove items from the desk, before converting to a bed? What can be placed on the desk? The recommended weight limit is around 25 kg, and the more this is spread across the desk surface the better the balance when converting. To remain in place whilst converting, items need to be less than the ‘under bed height’ shown in the dimensions drawings and table (44 cm for a Single; 46 cm for a Small Double and Majestic; 48 cm for a Double). Larger monitors, for example a large iMac, can be mounted on to the bed cover. How easy are they to convert? The process only takes a few seconds in both directions, and can be safely done even by a child. For added security there are 2 simply – operated safety latches which will firmly hold the desk in place. How robust is the StudyBed? StudyBeds are an extremely solid, weighty piece of furniture; finished in either a choice of sprayed colours, or a range of highest quality real wood veneers. They are solid free-standing items of furniture which do not require fixing to a wall (except the Majestic). They are designed for everyday use and come with a 5 year, first-owner guarantee. As there is so much choice of mattress type, plus the fact that many people wish to swap over an existing mattress, mattresses are not included. However, we can supply very good quality mattresses if required; see here for further information. StudyBeds take conventional standard sized mattresses, ideally up to 20 cm deep, please check dimension details for exact sizes for each model or email us if in doubt. We can deliver and install anywhere in mainland UK. Delivery and assembly charges will vary depending on distance from our base in Oxfordshire; we will always endeavour to keep these costs to a minimum. The typical starting rate being £160 + VAT (£192) which includes installation. Please ask for confirmation. As StudyBeds typically end up in one of the smallest rooms in the house; it is necessary for them to come ‘flatpacked’. It is certainly possible for a competent DIYer to assemble the unit themselves (the job being made considerably easier with 2 people) but like any task being undertaken for the first time it can be quite time-consuming. We have our own very experienced assembly team who will both deliver and assemble at moderate cost. Once assembled, the unit can subsequently be moved quite easily to a different location by partial disassembling and reassembly. Generally speaking, for standard items, delivery times are around 4 – 6 weeks. We will however, do our best to accommodate anyone in a real hurry. If possible it makes sense to order well in advance of when you might need the StudyBed, especially if your order is for non-standard items. We do NOT dictate a delivery date to you; we will deliver at a time that suits you and will liaise carefully to achieve an agreeable date and time. Where and when can I see a StudyBed? 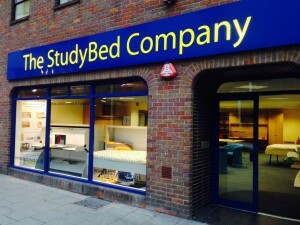 We have showrooms in High Wycombe, Thame and Warrington where a range of StudyBeds are available to view. Details and opening hours can be found here. StudyBeds carry a 5 year, first-owner guarantee against failure of any part of the mechanism or structure. But even if your bed is over 5 years old, or you have acquired it second-hand, if you encounter any problems at all, please do contact us – we are here to help! Also, as we manufacture ourselves, replacement parts are always easily available in the event of accidental damage. If you can’t find the answer to your question above please contact us for further assistance.